Last December when we were in New Zealand, we saw these beautiful Russell Lupines growing wild practically everywhere we went on the South Island. They were profuse on roadsides, beside hiking trails, along streams, and in meadows. The colors were a feast for the eyes. Most were in shades of blues, pinks, and purples. Occasionally we saw some yellow ones. Talk about eye candy! 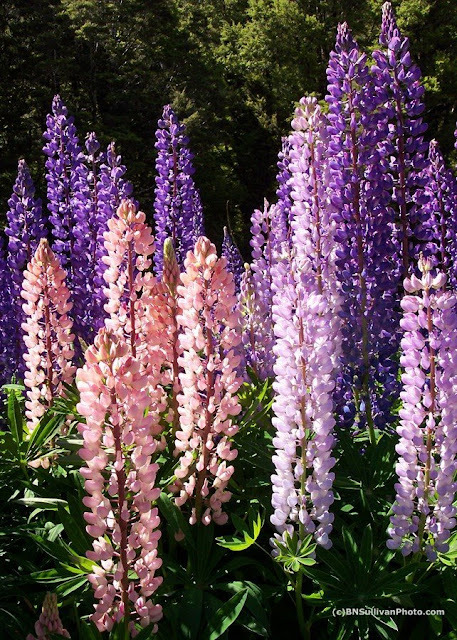 I love Lupines. These are beautiful. We have these beauties too - love the colors! I just really love lupins. I saw them in Canada and couldnt get enough of them. Thanks, everyone. I guess it's unanimous. Everyone loves these flowers. Lucky for all of us, they grow in many places in the world.